Probably yours are always well-behaved. Probably yours never squabble over dinner, or while doing chores, or (my personal favorite) in the backseat of the van on the way to church? Probably you just say “Love one another, dears” and they drop their quarrels? But mine are human, and riding in the van is at times my own personal torment. We’re in a space the size of a closet and no one can move without bumping someone, speak without rattling ear drums, or step out for a moment’s peace. We have five opinions about music choices (“I want the OLD Kings’ Singers!”), game selections (“I am SICK of I-Spy!”), volume levels (“Guys, I can’t hear myself think!”), temperature controls (“I’m so hot I’m gonna die. Can you open the window?” “No sweetie, it’s blizzarding so hard I can’t even see the road…”), and a myriad of other domestic matters. Irritations grate harder, words and actions get out of control, and parents are immobilized by seatbelts. Consequences are postponed and therefore not much to worry about, apparently; and if anyone is in a bad mood or predisposed to pick on a sibling, there is no escape. I have a little piece of magic to tell you about. A stoplight system on the sun visor. 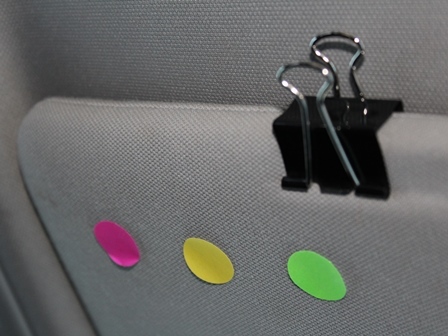 All you need is garage sale stickers and a paper clip. The clip starts off to the side, and is moved by the parent as needed. Green light is a warning—please stop what you’re doing. Yellow light is a warning and a moderate consequence when we get home—they know what it is. Red light is a warning and a stiff consequence—yup, they know that one too. We have a stoplight for the 4-year-old and another for the 7-year-old, and sometimes a verbal one for the rest of us. All colors are reset when we exit the van. I can’t tell you what a relief this has been. It’s concrete and visual: a powerful motivation. No hounding: just moving a paper clip. No forgetting to enforce: the tale is right there. To those who will think this system hopelessly lenient: no, I do not always warn my kids three times before letting the hammer drop. And to those who think it impossibly strict: no, I don’t believe in letting children act as they please without a reckoning. But we could all use an extra dose of grace, especially in the van, and including Mommy… I’m still learning. What do you think? Anyone up for a road trip? That works for shorter trips, but longer trips need a process for de-escalating the lights. Reset every hour? Return to lower level after fifteen minutes of peace…? Love it!!! As soon as I find my stickers, I’m on it!! Just in time for our 17 hour trip to Arkansas! 🙂 Great idea, Shari! And Ryan’s advice to reset every hour for the long trips is also good advice. You two make a great team. This is genius. My only complaint is that you didn’t share this idea BEFORE our road trip last weekend! I have been known to slam on the brakes and bring the van to a complete stop in the middle of the road (no vehicles were behind me, of course). (It was on the way home from an evening church service!) The sudden cessation of motion silenced the young ones, and the mortification over the possibility of someone SEEING US sitting there (!!!) produced an instant solution to the argument that the older ones had been having. WHAT is it about drives to and from church, that creates such a ripe environment for turmoil?! What a wonderful idea! Is that called quiet discipline? Lol! I don’t have to say a word…but they sure get a message?! Thanks for this idea! Our children always, yes always :), get to squabbling in the car. We are definitely going to try this! Nothing makes me feel more itchy, claustrophobic, and full of dread than the thought of spending hours on end trapped in a vehicle with my children. Oh yes, it’s like a little trigger switch flips on when they hear Mom say, “Get in the van!” It starts here with “It’s not my turn to sit all the way in the back!” before they even get in. A class we took encouraged parents to take the family out to the vehicle for practice sits of 20 minutes at a time. If there is unpleasant behavior in that time period then you do another 20 minute practice sit. Or each time your driving and children aren’t behaving they know there will be a 20 minute practice sitting for that time. My children aren’t old enough to try it on but its an idea that is being stored. clever. My only fear is that I would mess up the light systems and then that would start another argument. for some reason this makes me laugh. isn’t that just the way it goes?! Shari, why weren’t you around when I was raising “The Boss” and his siblings? Do you actually stay awake at night, while the rest of us are sleeping, to come up with such creative ways to keep the peace? I’m so impressed! Your post and the comments made me laugh! Sometimes you just have to laugh when dealing with fighting siblings! I mean, what did we do wrong?!! Sometimes, esp. if I’ve read too much Rod&Staff (no offense to anyone!) or something like that, I get to wondering why we don’t have such a “Christian” family! But don’t you think, these years are still gonna’ pass too fast?! On long road trips, we might loan the whole Laura Ingalls series of Books on CD to listen to, or other interesting books. Then even honey and I enjoy the trip! I usually read to our children on the 1/2 hr drive to and from church. They love it so much and are quiet. But if they start things up, away goes the book because I will not compete with that. So usually they don’t bother getting anything started. It also helps to have a twelve passenger van and only 8 passengers most times!! My poor suffering parents could certainly have used this. My brother and i were absolute terrors in the car. Of course, it’s too late for Bob and me, as our kids now have families of their own, but i really like your system, Shari… and i don’t know why it couldn’t be applied in situations other than during a car ride. 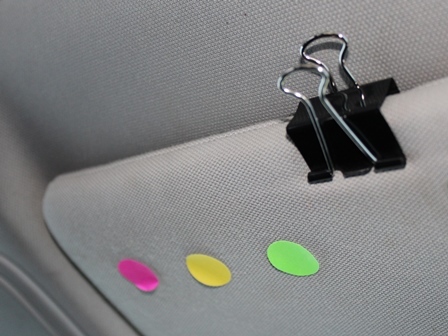 I’ve no doubt that I would cleverly slide into a snowbank while carefully adjusting my paper clip. I suppose that would scare everyone out of their arguments as well, so perhaps it could be useful. Yes, my children are so well-behaved. I feel like I should write a how-to book. Our kiddos learned that if the van did not stay peaceful (try FIVE kids in a van, several with special needs) the van would come to a stop in a safe place and remain ever so boringly STILL until all was peaceful and calm again . . . . Meanwhile, Mom or Dad would bury themselves in a good book or the phone OR . . . worse yet . . . turn up the music as loud as THEY pleased till the van fairly rocked . . . 😉 It was surprising how quickly even the new-comers to the family who were “old and set in their ways” could figure out the “system”. Each family obviously has to find what works for them, and I think your idea is creative as well! Should add–5 kiddos in a mini-van . . . that is FULL esp when you add in car seats and adult sized kiddos.